I look back fondly to the days when Big Guy played happily with his tiny pots and pans as I cooked. I recall happily the times when Little Guy was content to rummage the Tupperware while I fixed dinner. Oh, wait. That was just last week. It’s a whole new ballgame now that the guys have discovered the joy of cooking – you can create colossal messes and get in Mom’s way. What more could a kid want? Big Guy long has been interested in “helping,” but on his terms, which usually involved covering the table, chairs, floor, himself and Little Guy with flour. And Little Guy is interested in anything Big Guy does. He’s trying to catch up on those two years he lost due to being the second born. I’m sure it started as a scam – Big Guy will do anything to mooch icing. 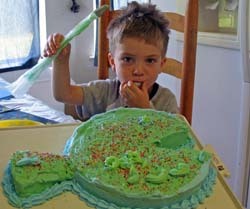 But then he wanted to decorate the cake, not just himself. I frosted the cake and piped a border, but he took it from there. He’s decorated all his cupcakes since. Not impressed? Neither was I. It doesn’t take Dr. Spock to figure out how to get a kid interested in a sweet, sticky mess. What happened next, though, was pure genius. Or it would have been if I’d planned it. But, then, if I had planned it, it would have been my idea, and that wouldn’t have worked with Big Guy. Monday, I faced a freezer bereft of bread, marinara and pizza crust. I had tomatoes that needed salsa-ed and bananas on the verge of drawing flies. It was time for serious kitchen work. I warned the guys that they would have to play while I got some things done. In exchange, they would get pizza for dinner. I loaded the food processor with secret marinara ingredients and gave it a whirl. Big Guy was by my side in 3.6 seconds. “I want do to it! 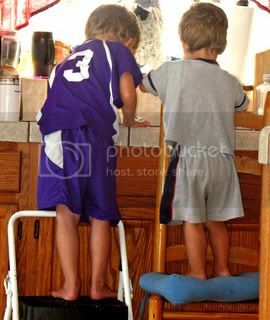 I want to do it!” And, of course, Little Guy quickly joined us when he heard Big Guy drag his cooking stool into the kitchen. We repeated the process with the bread and crusts. I measured as four little hands took turns counting and dumping. I read the recipes aloud so Big Guy could make sure I hadn’t forgotten anything. Again, two heads gathered around the sink and rinsed vegetables. Four hands took turns – nicely, with no shoving! – feeding the food processor. “Yum! Sure smells good!” Big Guy smiled. Did I mention that Big Guy hates tomatoes? That he’s never in his life let salsa touch his lips? Yet, he attacked it with the appetite of a starving man. Helping make it must have assured him I wasn’t trying to feed him Decon. A bit later, four hands spread sauce and sprinkled cheese on crust. More accurately, two hands spread and sprinkled as Little Guy shoveled cheese and sauce into his mouth. “Yum! Sure is good!” Big Guy said as he ate. Sure is healthy, too. My secret marinara ingredient: Spinach. Four boxes. If you grind it finely enough, it looks amazingly like basil. That’s right: The world’s pickiest eater served himself a heaping helping of spinach. And loved it. Dessert was a hunk of banana pound cake. Big Guy also hates bananas. So I’ll deal the mess. I’ll put up with everything take three times as long as it would without all the extra help. I figure it’s a short-term loss, long-term gain. At this rate, Big Guy will be able to cook prime rib by the time he’s 6, which means he can prepare Christmas dinner while I sleep in.